Zermeno was wrong. They struck on Friday night. The mural, at Melrose and Fairfax in Los Angeles, shows James facing a handful of Lakers legends looming over Staples Center, where Los Angeles plays its home games, and over the Great Western Forum, which the team formerly called home. The retired Lakers shown included Kobe Bryant, Wilt Chamberlain, Magic Johnson, Kareem Abdul-Jabbar and Shaquille O'Neal, along with late broadcaster Chick Hearn. Zermano said he and five friends devoted 45 hours over five days to producing the mural. On Friday night, vandals threw white paint on it. As Zermano was working on restoring it Saturday morning, several dozen Lakers fans helped out, Zermano said, adding that he was surprised the vandalism happened in the first place. The image, he said, was to "just show LeBron paying homage to not only past Lakers legends but the whole organization. Him showing up to the Lakers and knowing he has some big shoes to fill," according to ESPN. A previous mural touting James' decision to join the Lakers earlier this month also drew the wrath of vandals. The artwork, by Jonas Never, depicted James in a Lakers jersey with the message "King of LA" on a wall at the Baby Blues BBQ restaurant in Venice. 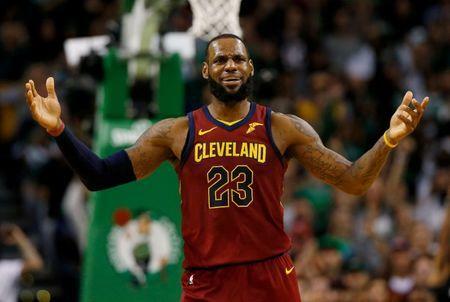 The mural was first hit with a spray-painting of "We Don't Want You" and "No King," as well as "3-6" -- an apparent reference to James' record in the NBA Finals. James won two titles while with the Miami Heat and another upon his return to the Cleveland Cavaliers, where he began his career in the 2003-04 season.